The protest comes as Union of Northern Workers delivers notice of intent to strike. N.W.T. 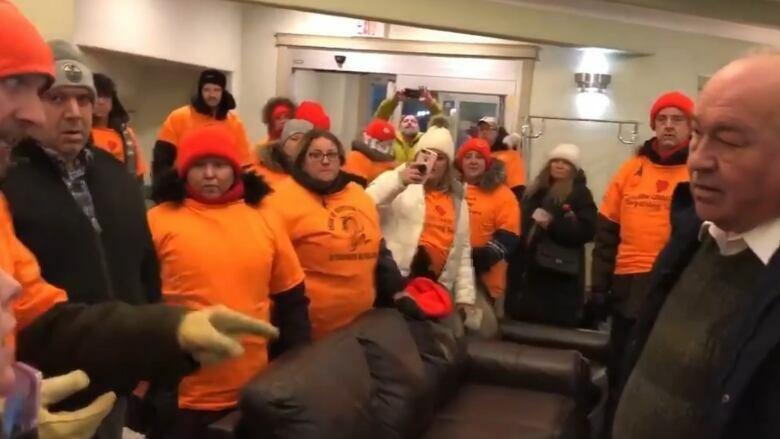 Premier Bob McLeod fled his own constituency meeting Tuesday night when a group of unionized employees descended in a surprise protest. Dozens of people represented by the Union of Northern Workers showed up to the Stanton Suites in Yellowknife, demanding to know why the premier is encouraging employees to cross the picket line should a strike happen. Earlier Tuesday, the union sent a strike notice to members. It says if a deal isn't reached during mediation this weekend, a strike will begin at 12:01 a.m. Monday. In response, the territorial government sent out a notice to employees acknowledging that some unionized employees may want to work through the strike. Those members are "encouraged to discuss their choice with their union representative," it says. "If you choose to report to work, you may need to cross a picket line at the beginning or end of your work day and your supervisor will discuss with you protocol for doing so." On his way out of the boardroom, McLeod repeatedly told the group there is a collective bargaining process and he can't comment further. "My constituency meeting is for Yellowknife South members," he said. This spurred the crowd to shout at the premier that they are indeed constituents of McLeod, who is premier. About nine constituents were already at the meeting when the protest erupted. McLeod stayed in the lobby of Stanton Suites for a few moments to speak with a constituent who was attending for the first time. After they were interrupted by shouts from protesters, he remained briefly while people admonished him for sending out the directive, which he said he had no knowledge of. A woman handed a print-out of the directive to him, and he pushed it away. He departed the hotel shortly after. "I think that he could've handled things better," said Sheila Laity, a McLeod constituent and UNW member. "I think that he needs to engage with people, not run away, which is essentially what he did." About 4,000 territorial government workers represented by the Union of Northern Workers have been without a collective agreement since 2016. Zero-per-cent salary increases for 2016 and 2017. A 1.4-per-cent increase in 2018 and 2019. A 1.7-per-cent increase in 2020. The new offer adds an extra year to the previous one and less than a per cent increase for the final three years. At the time, the government also claimed its offering wage increases that surpass inflation, when taking into consideration step increases. The union balked at this claim, saying less than half its membership qualifies for this type of yearly wage increase. In a news conference earlier Tuesday, union president Todd Parsons said his team isn't bluffing when it comes to the possibility of a strike. "We will act and we mean business," said Parsons Tuesday afternoon at a press conference on the strike notice.